In an IHS Markit exclusive, esteemed economic expert Nariman Behravesh, revealed that although the global economy started 2018 with strong, synchronized growth, the momentum faded as the year progressed, and growth trends diverged -- and will persist in 2019 leading to a sharp drop off in world trade. 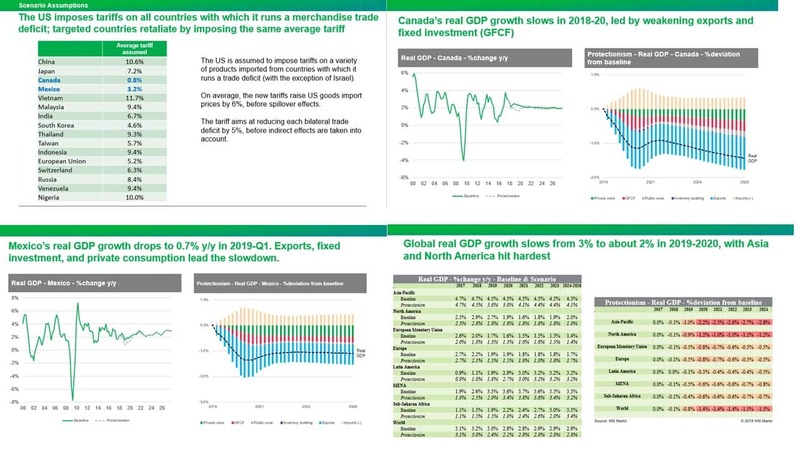 Prepare your organization for what's around the corner with IHS Markit's powerful insights, generated from our The Global Industry Scenario Service. This service provides actionable insights on which industries and geographies most feel the consequences of an economic or geopolitical incident, and which can withstand additional pressures, such as understanding the impact of a trade war between the US and countries with which the US has a merchandise trade deficit. Preview below. Fill out the form for the full report. Impact of a trade war between the US and countries with which the US has a merchandise trade deficit.